Volvo Penta’s pioneering self docking technology was put to the test when it automatically docked between two Volvo Ocean Race 65 yachts. The unveiling of the pioneering self-docking yacht technology is the latest in Volvo Penta’s ongoing ‘Easy Boating’ philosophy to make boating simple, enjoyable and accessible to more people. At its heart is the joystick-controlled Volvo Penta Inboard Performance System (IPS), a complete and integrated propulsion system – from the helm station, via the engine, all the way to the propellers. 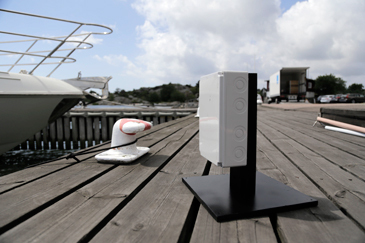 Sensors on the berth help guide the yacht safely into its docking position.